All language-learners face the difficulties of regional variations or dialects. Usually, it takes the form of an odd word or turn of phrase or a peculiar pronunciation. For most languages, incomprehension is only momentary, and the similarity — what linguists often refer to as the mutual intelligibility — between the standard language taught to foreigners and the regional speech pattern is maintained. For a language such as French, only the most extreme cases of dialectical differences, such as between Parisian and Québécois or Cajun, pose considerable difficulties for both learners and native speakers of dialects close to the standard. For other languages, however, differences between dialects are so great as to make most dialects other than the standard totally incomprehensible to learners. Arabic is one such language. 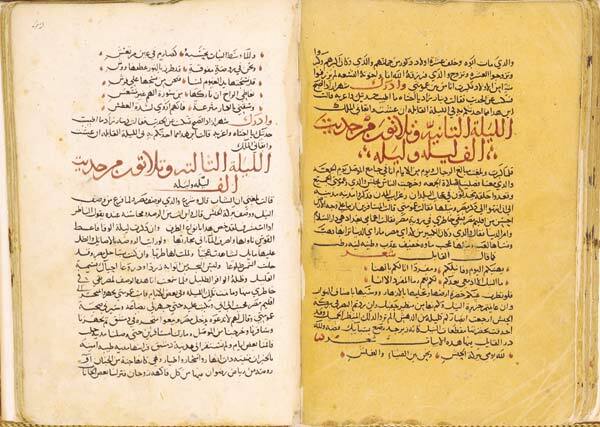 Two pages from the Galland manuscript, the oldest text of The Thousand and One Nights. Arabic manuscript, back to the 14th century from Syria in the Bibliotheque Nationale in Paris. Public domain via Wikimedia Commons. For example, Levantine dialects make use of agent participles (faakira, the one thinking; raayihun, the ones going; maashi, the one walking) instead of actually conjugating the verb (‘afkuru, I am thinking; yaruuhuuna, they are going; tamshiina, you are going). However, these same dialects, as well as Egyptian, have also created a series of verbal prefixes — small non-words that come before the conjugated verb — in order to refine the duration and timing of an action when conjugated verbs are used: baya’kal, he eats; `am baya’kal, he is eating; raH ya’kal or Ha ya’kal, he will eat. Such distinctions are familiar to speakers of English, but are not immediately apparent in Arabic, whose verbal system seeks to stress other types of information. Heading image: Golden calligraphy by Quinn Dombrowski, CC-BY-SA-2.0 via Flickr. You comment about different ARABIC Dialects which are very different in ciuntries (Marocco/Siria/Lebanon/Egyot. But the international Arabic (tv/Aljazeera/Newspapers) or Clasic Arabic are the same in all arabic countries. 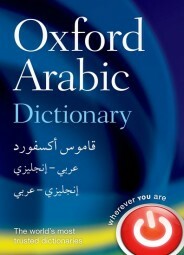 But its very strange that you include BEREBER or FARSI as arabic dialects. FARSI (Iran) DARI (Afganistan) URDU (Pakistan) and HINDI are indogerman or now called indoeuropean languages and not arabic dialects. As well as BEREBER 4 dialects are very different from Arabic as all the TURQISH Languages (OugroAltaic Origin). Certainly all languages in ISLAMIC Regions have had a big influence of arabic term and some as FARSI have the arabic caligraphy because of the influence of the Islamization and in 5th or 6th century. Like for instance SPANISH has been influenced by ARABIC in 9th – 14th centuries by the Arabic culture and islamization of Al Andaluz and Califat of Córdoba but SPANISH with 4000 arabic words is not a ARABIC DIALECT !!! “The dialects of the Persian Gulf area show the influence of Persian and Hindi, both of which were the languages of important trading partners for the region’s merchants.” – Persian (Farsi) and Hindi only had influence on some dialects of Arabic, because they were important trading partners in their geographic area. This same statement holds for Berber as well as for Aramaic (which both are relative to Arabic, being members of the Afroasiatic language family, but they certainly NOT are Arabic languages/dialects). Having an influence does not mean being the same. I know that text comprehension is not easy, but next time, before you leave a comment, please, try harder (and avoid all-caps words if possible). Well there are some flaws. It is inaccurate to say “Arabic and foreign languages” because in Levant for example, Aramaic is the original language where Arabic on the other hand is the language of the invading Arabs that brought Islam to the region. Even many (not most though) of the Lebanese and Syrian Muslims are not Arabs but Arabized-Arameans (who were originally Christians and spoke Aramaic instead of Arabic) but now they identify themselves as Arabs and therefore it is not accurate and scientific identification but more of emotional one. Aramaic is the native language of the Levant as Coptic is of Egypt and Berber of Maghreb region. The invaders’ language “merged” with local (by merge, I mean a very gradual process to varied degree of success in different regions). In matter of fact, in Lebanon we may be speaking more Aramaic than Arabic but much of the words that we perceive as “Arabic” are actually Aramaic. The reason there is poor identification of the real weight of Aramaic in daily Lebanese is because it is not politically correct to embrace our own culture. Therefore the perception of what we speak is very non-scientific and non-academic. Examples are numerous.. Another example is names of Lebanese towns. Except for some that are Greeks (Tripoli), Canaanaite/Hebrew (Tyr, Sidon,..) and not sure if there are any in Arabic, most are really Aramaic (faraya, maaraab, bchari, bakaata, chtaura, zahle, tanourine, etc etc..). I enjoyed reading the article, but just thought to emphasize the weight of original languages as Arabic is the additive not the other way around. Thank you! If we look at the differences of dialects we can say the same things that the writer said for many languages. A person who wants to learn any language shouldn’t care much about the dialects but concentrate on the learning the fundamentals of the language.